What is VIX Pricing (here)? What is volatility currently “pricing”? 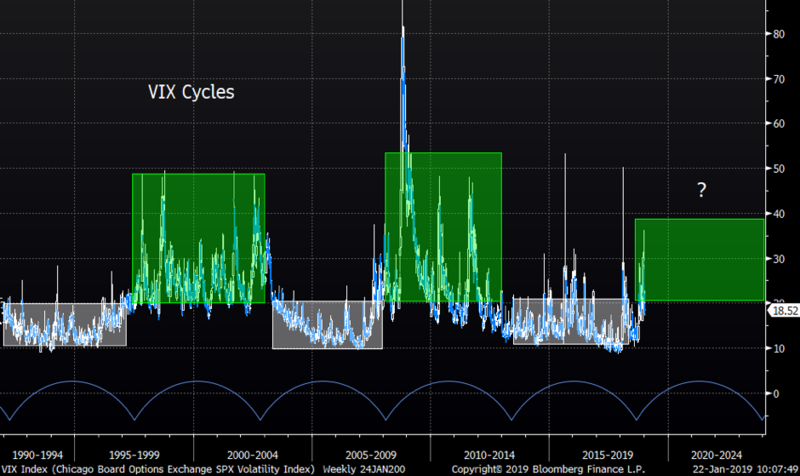 Many speak about the fear index, the mighty VIX, but few understand what volatility truly is. Even less understand how to trade volatility, nor how to use it for hedging purposes. We won’t go into a detailed discussion about volatility here, but every time volatility reaches a “local” extreme level, it is good to take a broader look at what is being priced, especially in times of (recent) turbulence. As we approached last October, volatility was a “depressed” asset and not many planned hedges, nor did people think a vol shock was around the corner. VIX went from “sleeping” levels around the 11/12 area to 25 in a few days. VIX then started establishing itself on a new, higher, plateau. The December turbulence took the VIX to 35. The bearish camp started explaining that VIX should go even higher as shorts were getting killed. All these pundits are usually proven wrong, as they always tend to confuse pace with direction. VIX and other volatility instruments have a mean reverting feature that most people forget about. So, when the crowd on media start talking about further exploding VIX as they did in late December, they usually have no clue what a certain level of volatility actually means. VIX has gone from 35 in late December to currently 16.5. We won’t go into details, but volatility is proportionate to the square root of time. Hence, a vol level of 35 prices daily moves of the underlying asset of around 2.2%. So, when volatility of the SPX traded at 35, “the volatility” was pricing daily moves of some 2.2% in the SPX index. Sure, people bought VIX in panic, but they once again forgot what they actually where doing, i.e. betting that the SPX would continue to move at least 2.2% on a daily basis. Don’t confuse pace with direction! Currently the VIX trades at 16.5. “Volatility” is pricing approximately 1% moves in the SPX at these levels. If this is “fair” or not is up to you to decide, but given the actual moves as well as the many macro risks still a possibility, volatility is not trading overly rich here. 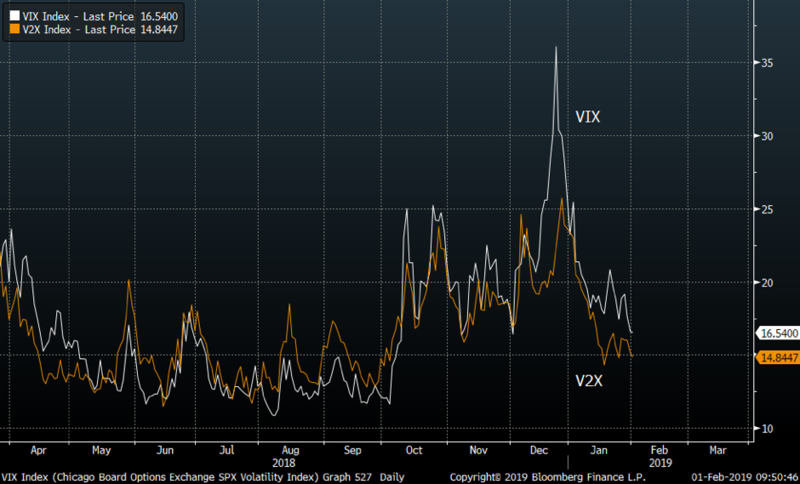 Chart of VIX and V2X since last spring. The below chart shows SPX implied vol (blue) and realized volatility (30, 60 days). 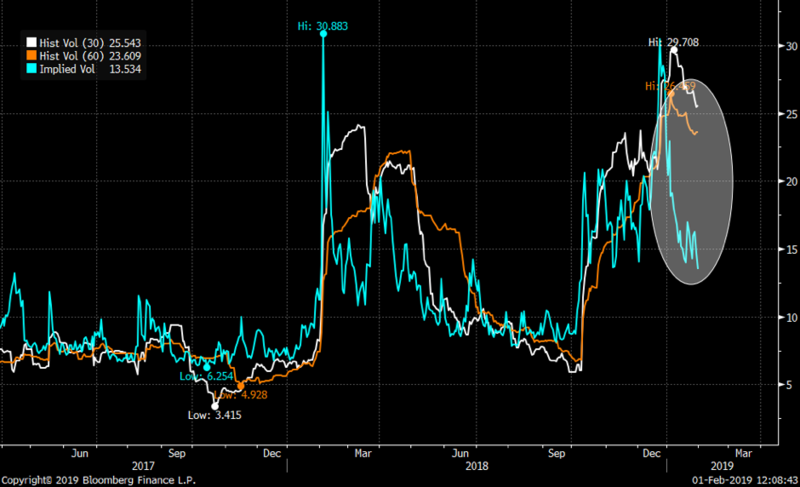 There is always a lag in realized volatilities, but we can clearly see that the gap between implied SPX vol and realized vols is getting rather big. On a very long-term basis, the “natural” levels of VIX is lower, but given the macro situation now (and at earlier time periods) volatilities can stay elevated for several years. The chart below shows the SPX term structure. 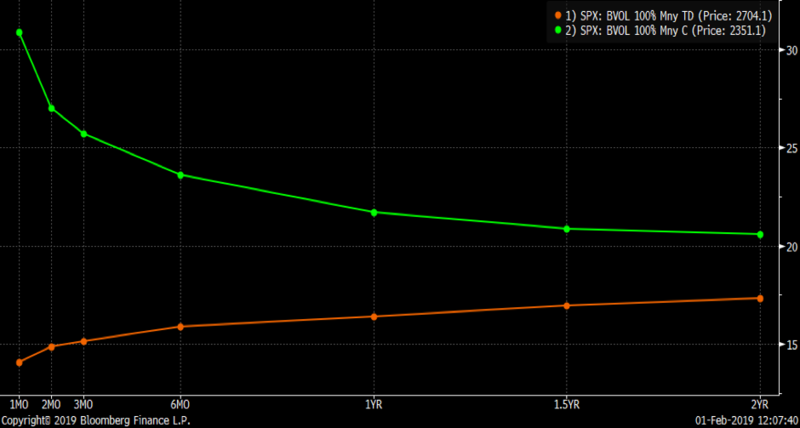 Note how current curve (orange) has imploded compared to Christmas (green). The move lower is huge, and the shift in shorter term maturities even more extreme. Our point is that the crowd always get volatility and hedging wrong. Investors tend to overpay for protection as they buy hedges in fear at wrong levels, not thinking what they actually pay for in terms of “implied moves” and other possible risks. We doubt investors actually did believe the SPX would move more than 2% on a daily basis going forward when they bought protection in panic around Christmas. The opposite often happens when volatility implodes after big spikes in VIX. Investors tend to hate protection when markets have bounced and suddenly, they start thinking about how expensive these hedges have become as markets move less and theta decay is painful. There are many risks investors consider on a daily basis, but it is all biased by the current narrative in markets. For now, Powell saved the world, but new risks are very much alive, some known and some unknown. Prior to the Fukushima disaster, the rare oarfish was found in nearby waters. In recent days 3 of these rare fishes have been found floating near Japan. They live in the deep ocean only and finding them near the surface is associated with impending natural disasters (more reading on the rare fish in Japan here). We won’t track rare fish in order to trade the VIX, but given our logic above we find long options strategies getting increassingly interesting plays at the levels of volaitlity. 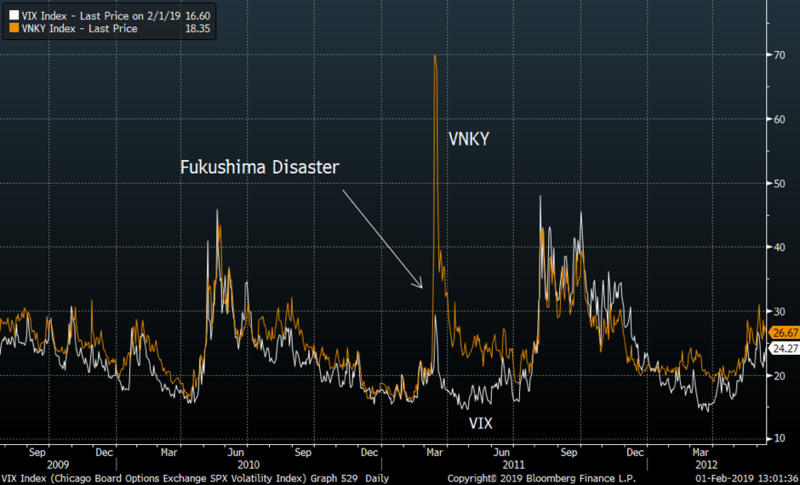 Remember the vol shock around the Fukushima disaster?